2011: Developing SPOT, a hyperfast, memory based, search engine living inside my own tiny Java portal, inside Tomcat or Jetty. Used for job search for Scandinavian Personnel (see http://scandinavianpersonnel.com/search.html). 2010: performance tuning of the iBooking.no database, which has hundreds of thousands of training center member users in Norway, and which serves around 200 training centers around Norway 24/7. This Linux based system was developed and run by SmallSoft, but is now maintained by ibooking as and served by LinPro. 2008, 2009, 2010, 2011: More MIMAS (see below) improvements. The number of users and Telenor's dependence on the system have increased. 2007: Sterling Management for CompTel. Designed and implemented a redesign of the 300k line Java project Sterling Management system to improve the system startup time from several hours to a few seconds, by redesigning the distribution architecture. The system is a graphical management solution used to manage a non Java telecommunication mediation system which performs telecommunication charging, accounting, mediation and billing for a giant installation at Vimpelcom in Moscow, which deals with millions of mobile customers. 2006: Insourcing of MIMAS for Telenor Key Partner. MIMAS is a large J2EE solution (around 150k lines) used by around 100 users daily around the end of each month. The system is used for consolidating accounts between most Telenor companies in Norway, Sweden and Denmark. The insourcing ported the system from Telenor's large Vignette based @Work portal to a much simpler Linux portal solution based on Lacador, a very stable J2EE portal system made by Prime Partner. 2006: Insourcing of TAB for Telenor Key Partner. Similar insourcing technology as for MIMAS. Improved stability and regained control of the development and deployment of the application. Improved performance significantly for the user, in one occation by 100 times compared to the Vignette based system (by going from 38 seconds to 0.37 seconds for one request made by an end user). Oracle 9 was used in both the @work and Lacador based solutions. 2004: Several assigments for TietoEnator related to RoS. 2003: INFOMEDIX RoS, development, maintenance, and design of new architecture for RoS, a healthcare system for hospitals which integrates an EPJ (Electronic Patient Journal) system with various laboratory systems and radiology systems. The system is in daily use in many hospitals in Sweden and Norway. RoS is heavily based on XML. It may be viewed as a health care oriented XML document storage system kernel with a number of interface gateways specific to each external system. In this project I worked with Java and C# (and some Visual Basic 6.0). 2002: Petra, pair programmed with Condev AS, a consultancy company to the oil industry, on the design and implementation of a new input system to Statoil's Petra, a 100k lines C++ gas, water and oil flow simulation system which has been in development and commercial use for many years. 2002: Teleradiology, participated in the first part of a development project where Oppland Central Hospital and Ullevaal University Hospital communicates radiologic (X-Ray, NMR, CT) images and XML based service requests and responses between radiology departments. My role in the project was primarily to make the XML based radiology information system on the requester side communicate with the service provider side using a KITH defined XML message definition which is currently under development, and to participate in the definition the replication oriented protocol used between the radiology information systems involved. Techology base is Java and JSP. 2002: SOAP askkapaks, a Java only based inhouse telecommunication support system used by the second largest broad band company in Norway (Catch Communications of Bodø), now merged into Ventelo. The JSP (Tomcat323 under Linux MD8.1) based askkapaks system uses a new SOAP based machine2machine interface to kapaks, which is Telenor's line and customer database open to other tele operators in Norway. The system was for many years used in production every day (and night), and was used behind the scenes of the web based SDSL coverage query system on the home page of Catch, and for internal population of the technical information Catch has for each customer. 2001: askkapaks, a Java only based program which accessed a previous interactive version of the kapaks system using HTML browser simulation in Java. 2001: RECO, a mediation system (for telecommunication services billing) delivered from 4Tel in Bodø to VimpelCom in Moscow. I implemented a module which transforms ASN.1 BER coded call records for mobile telephony into corresponding call records used internally in the RECO system. C++. 2001: LSD, a PHP + Postgres based inhouse telecommunication support system used by Catch. I implemented a general wizard oriented web based system which is used by all other applications of LSD. The LSD system is in daily and heavy operational use inside Catch. 2001: NOKIA 9210, experimentation with Java development for Symbian portable devices, with a focus on Nokia 9210, actually before I got my 9210. 2001: Care comm, prototyping an early system module for Care Communications in Tromsø. 2000: ZAPROXY for Smallsoft/Catch Communication - a general web based command interface to a collection of Unix like computers. I designed, constructed and built this system from the ground up using only freely available technology: Java servlets, MySQL, cygwin unix emulator for Windows NT. Being Java based, it can utilize any Unix/Linux/Windows 95,98,2000,XP,NT(with cygwin) machine and access MySQL, PostgreSQL, Sybase and Oracle databases through a password protected web browser (HTML/CSS) interface from the internet. The commands of the system are represented in a programming language designed by me for this purpose. The complete technology is under Smallsoft control, but may one day turn open source. The application of this basic technology has been for a range of telecommunication support systems (customer support, network management, customer coverage analysis, logistics, statistics, charging etc) for Catch Communication. These systems are no longer in daily use. The zaproxy system is currently not under active development, but the technology is still available inside Smallsoft, and may one day be used for similar projects. 1999: TAD - a music CD artist+title matching system developed for the Miami based MSI Music company - in C, Sybase SQL, and Power Dynamo (a web interface to Sybase.) Around 8000 lines of fairly complex Sybase SQL code. 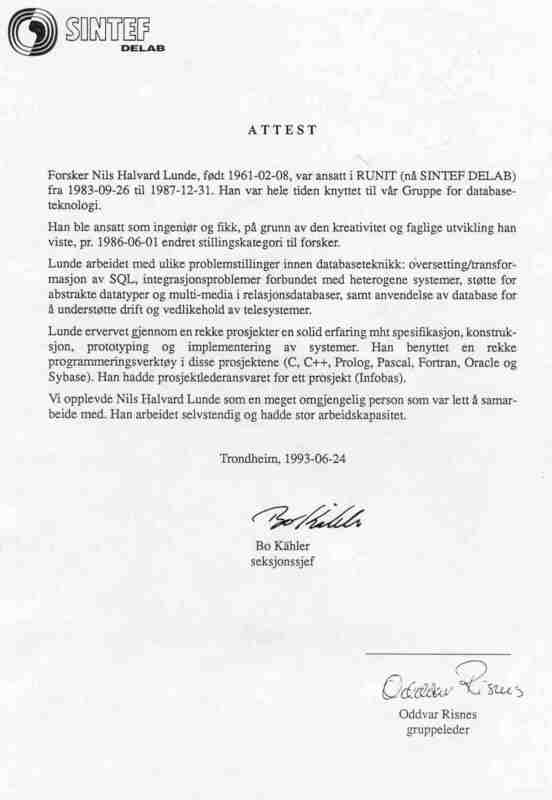 1998: A1338 for Telenor/Alcatel (high performance telecommunication CDR storage facility) in C++. One of my contributions was a very fast compiler/interpreter for predicate evaluation (150 000 call record tuples evaluated per second). 1998: Smallsoft, implemented our pathetically looking, but still highly effective home page at www.smallsoft.com, hand crafted in HTML. 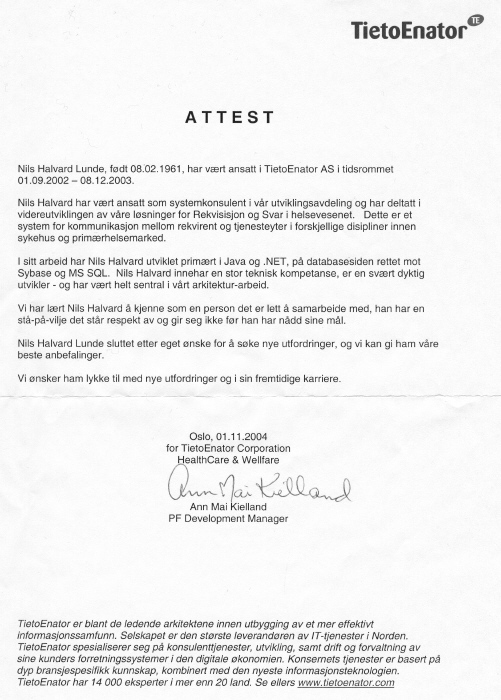 1998: RECO for Telenor/Alcatel (similar to SENTAKS (see below), but for systems outside of Norway). 1989-1996: SENTAKS for Telnor (the main telecommunication charging system used in Norway) in C. My main contribution apart from general design input was a very fast caching mechanism used for runtime access to control tables used when processing the call details records which are used to make telephone bills. This cache system is still in around-the-clock operation in several countries. Linux XUbuntu 12.04LTS, 11.10, Ubuntu 8.04, 9.04, 10.04LTS, 10.10, Fedora 2, 7, 8, Linux Mandrake 7.2, 8.0, 8.1, 8.2, 9.0, 9.1, 9.2, 10.0, Redhat 5.1, 6.1, 6.2 (on various hardware architectures). Since June 2003, Smallsoft Tromsø (i.e. my server park in my engine room) has been the host of all climatic road datas for the North of Norway for Statens Vegvesen. Around every half hour, new data has been provided by Smallsoft, and every day thousands of requests have been served by Smallsoft in Tromsø 24/7. This has taught me a lot about Linux server performance and uptimes (generally impressing), network service uptimes (better than most web hotels? ), and keeping hundreds of gigabytes online. System for automatic stock trading written in Java with Java graphic presentation of trends etc. for porting a DOS system for tax reporting to Windows (Finale). 2001-2002: Taught "Object oriented programming in Java", a 4 unit course given to first year computer engineering students at the computer engineering department of HITOS (Tromsø University College). I made several examples, mandatory and non mandatory exercises in Java and practical programming. I also made the exam, which amongst other things contained a 1000 line Java programs the students had to modify. 1990: A part of a database course D212, given at The University in Tromsø; focus on the relational model. Hardware maintenance: The past few years in Smallsoft, where I have assembled and kept operative a collection of many Windows, MacOS and Linux computers, have given me (too) extensive experience in how to install, configure, debug and revive old and new PC hardware (motherboards, disks, sound cards, scsi cards, screen cards, cdroms, BIOS) with a plethora of auxillary equipment (PCMCIA cards, modems, scanners, printers, cameras, synths, sound mixers, cdroms) as well as a 10/100/1000 Mbit Ethernet. Electronics: worked several summers as an electronics worker at Ulla Førre (North Europe's largest hydro electric power plant, found in my home county), during the construction of Ulla Førre, mainly with installing telephone cables and mobile radio transmitters and receivers. Worked two summers in a radio/TV repair shop. Apart from this, I have worked with electronics (building and constructing computers and musical synthesizers etc) as a hobby until around 1990. I have an electronics lab, and still power up the soldering iron from time to time. VLDB 1989 (Very Lagre Databases), Amsertdam. VLDB 1991 (Very Lagre Databases), Barcelona. ROOTS2001, ROOTS2002, ROOTS2003, ROS2004 (Recent Object Oriented Trends Symposium) in Bergen. Secretary of organizing commitee for ROOTS2005, Member of organizing commitee for ROOTS2004, ROOTS2003, ROOTS2002 in Bergen. Speaker contact for Mark Colan, a web service evangelist of IBM, and Jeroen Frijters of Sumatra Software. Supervision of "Master of Science thesis" in integration of heterogenous systems, at the NTH, The University of Trondheim in 1986. In addition to this chronological listing, I have written or participated in writing literally hundreds of internal reports, memos and design documents, mostly in English (and a few in Norwegian), but these are almost without exception company internal or have limited distribution, so they can NOT be listed here. Hva nytt kan teknologi gi kunst og kultur. Talk at KNYT2000 (available at www.smallsoft.com). Skog, K., Lunde, N.H., Hamnvik, R.
Guneriussen, T., Johnsen, H., Sand, K., Lunde, N.H.
Buvang, Ø., Johansen, M.E., Lunde, N.H., Skog, K.
Guneriussen, T., Høgda, K.A., Sand, K., Lunde, N.H.
Hamnes, H., Solbakk, S.A, Henriksen, E., Finnseth, A., Steinbakk, L., Lunde, N.H.
Hamnes, H., Henriksen, E., Lunde, N.H., Solbakk, S.
Hamnes, H., Henriksen, E., Lunde, N.H., Solbakk, S.A.
Børseth, H., Aas, G., Lunde, N.H., Østlyng, R., Skogstad, Ø.
Frøseth, Aa., Hove, J.O., Lian, S., Lunde, N.H.
Frøseth, Aa, Haug, J.O., Hvasshovd, S.O., Lunde, N.H. Updated Aug 15, 2012 by Nils Halvard Lunde. Please send me an email (nils@smallsoft.com) if you spot any errors or omissions!